Home to over 1.2 billion people, India stands as the world’s second most populous country, and it is only continuing to grow. With over half the population under the age of 25, India is predicted to surpass China in the next 15 years as the most populous country in the world. Because of India’s great size in both land area and population, the country is filled with diversity and variety, portraying a beautiful array of rich cultural traditions and customs varying from state to state and city to city. In the arid, northwestern region of the country lies the state of Rajasthan, known for the Great Indian Desert that winds across a majority of the region’s borders and beyond. Capital to this state is the unique city of Jaipur, founded by Maharaja Ram Seo Master II of Amber in 1727. As the city grew in importance and population, the King took an interest in its architectural development and design. Streets were laid, palaces were erected, and fortifications were established to protect the city, providing the necessary resources for the city to grow to become the commercial center of Rajasthan. Later on, buildings and streets were painted pink to imitate the red sandstone architecture of Mughal cities, attributing the nickname of “The Pink City” to the capital. Wandering the pink streets, you are sure to lose yourself in a vibrant and exotic world of color but will be unable to overlook the vast chasm between the wealthy and the poverty-stricken. While more than a million Indians are millionaires, most live on less than two dollars a day. Rather than residing in mansions, their dwelling is the squalid “slums,” a place full of health and safety risks, far from being a proper living situation. Opportunities for education and employment are very limited in these areas, and children often face a bleak future without access to essential learning and instruction. Globe Aware’s India program specifically targets these underprivileged children and focuses on supporting and collaborating with day care centers and educational facilities. Volunteers teach and interact with rescued child laborers and “rag-picking” children, in addition to aiding in local community development through beautification and improvement projects on facilities. The colorful culture of India is a culture like no other, and a visit to take in the extraordinary sights, sounds, and smells promises the experience of a lifetime. Join Globe Aware in India and see a side of this exceptional country often unseen by the average tourist. Enjoy leisurely activities like riding in a rickshaw through the old Bazaar, indulging in mouth-watering dal-baati, or making a sunrise visit to the Amber Fort, but most importantly of all, take part in fighting poverty and providing a higher quality of life for children in need. Explore India's colorful history - CLICK HERE! My trip to Peru was not my first time out of the United States, but it was my first voluntourism trip. It fulfilled childhood dreams and changed me forever. I cannot wait to go again, and to take my children when they are older. The places we worked in Peru and the work Globe Aware volunteers do there are fantastic. I worked hard, but the work was good. We did some landscaping, continued laying a cement floor, played games with the children, and helped with English homework. The coordinator Rocio is amazing, and I cannot thank her enough. The country is beautiful. The sites are majestic. This city is historic. Those are all great things, but being involved in this program gave me so much more. This trip gave me a real experience with the culture and the people of Peru. The people I met during my week in Cuzco were genuine, kind, and welcoming. The children are sweet and funny and I am lucky to have spent time with them. Volunteering, no matter where you do it, makes the world a better place. I am absolutely certain of this. I have been volunteering since I was a child, thanks to my family. And my passion for helping others was really ignited by some fabulous people I was honored to serve with in the military. Volunteering brings you a sense of humility, appreciation, and compassion. It is difficult to put my experience into words, as I feel words cannot do it justicee. Big Heart Home (translated from Quechua), Peru, and the people I met in my travels there hold a special place in my heart. The experience was beyond incredible. If you have an opportunity to go on a voluntourism trip, do it! You will not regret it. Just keep an open mind and an open heart, for that is certainly what you will receive from everyone there. Thank you Globe Aware and all the volunteers for all that you do around the world! As Globe Aware Volunteer Beth Karbe puts it, “Access to safe water is a basic need and a basic right of ALL people everywhere.” Beth is right. Clean water is not just a privilege or luxury – it’s a basic human right. Unfortunately, too many people on the planet are denied this essential provision on a daily basis, and sickness and death are too often the result. From Latin America to Southeast Asia to sub-Saharan Africa, limited access to clean water is a worldwide crisis that demands immediate attention and help. On a trip to a small isolated village nestled among the mountains of Peru, Beth Karbe saw first-hand what life was like for the villagers of San Pedro de Casta. With no reliable water source, all aspects of life are directly impacted, including farming, agriculture, sanitation, hygiene, and overall health. In an effort to provide reliable and clean water to these villagers, Beth has raised over $20,000 to be able to install large capacity water filtration systems, as well as smaller systems for families. The project has now also expanded to villages in Ghana that are also facing similar problems. These Sawyer Hollow Fiber Membranes have pores of .02 microns, a small enough size to block 99.999% of all pathogens that cause water-borne illnesses. This is the highest level of filtration available today. Not only that, but they are easy to install, maintain, and clean. With funds raised and people excitedly awaiting new life changes, Beth will return to San Pedro with Globe Aware in the summer of 2013 to help install these filtration systems in homes and facilities in the village. But many more hands are needed to accomplish this great project! Join Beth on Globe Aware’s San Pedro program and be a legendary part of bringing water to provide sustainability and a hopeful future for these villagers. 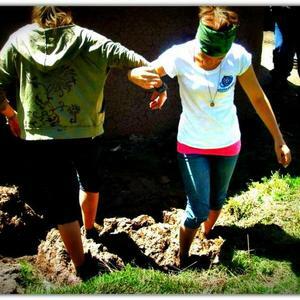 Be a part of this SPECIAL Globe Aware project in Peru and help us install filters on June 29 – July 6, 2013. Visit our website for more info! With current restrictions now being revised for the first time in decades, there has never been a better time to travel to Cuba! Come on Globe Aware’s program and engage your mind in learning the history, struggles, and stories of these open-minded and positive people. We guarantee your eyes will be opened to never-before-seen treasures! Check out our website for more information and upcoming trip dates! India’s great size means great diversity within the culture! Every state has its own cuisine that is specific to the region, and the dal-baati dish below is a traditional favorite in Rajasthan. There’s no set recipe for this well-balanced lentil soup and dumpling meal as every family adds their own unique flare. Try this recipe today with your own twist and get a taste of the flavor and zest in the Pink City! Add ginger-garlic paste and tomatoes. Fry. Add all the masalas, beans and salt. Simmer till well blended. Then roast in batches on hot coals till puffed and golden outside and spongy inside. Keep hot. Garnish the dal with coriander leaves and slit green chilies. 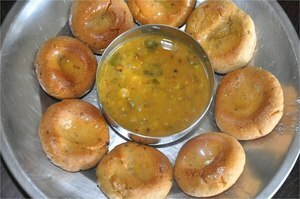 Dip hot dumplings (baati) in the dal while eating.